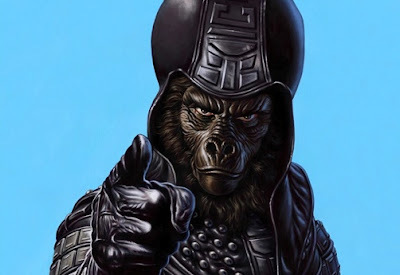 Go Ape with your Blood & Treasure Campaign! 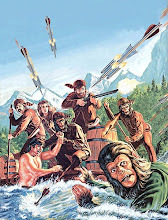 Over on the Land of Nod blog, John has started work on bringing Planet of the Apes to his Blood & Treasure rules. 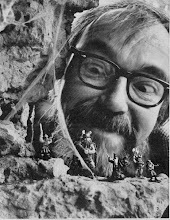 He has even been hinting (on Google+) about working up a Hexcrawl based on the first couple of movies and commissioning some art for such an endeavor! I'm really excited about this and hope it happens! I'd love to run an Ape Campaign! 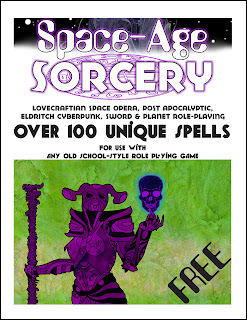 An awesome Free PDF came out this week, Space-Age Sorcery! It features over 100 really cool spells for your Sci-Fantasy Campaigns! Best of all it is free! In fact while I'm still reading through it, I can comfortably say it is better than several products that I have paid for! 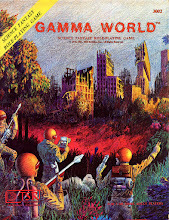 I've gotta tip my hat to Needles, Porky and Hereticwerks, the folks that put this one together! 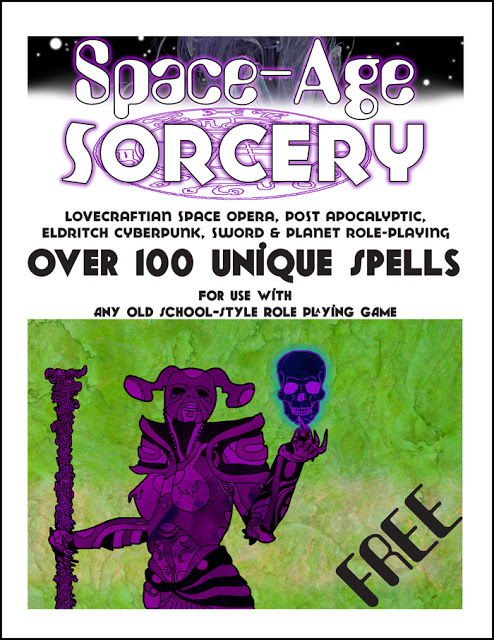 It is jam packed with all kinds of cool ideas for your Sci-Fantasy Campaigns! 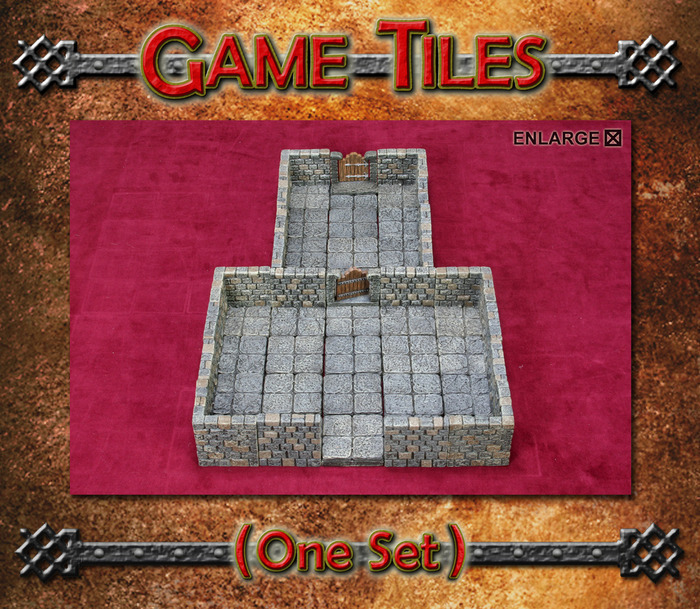 Game Tiles a Dwarven Forge Kickstarter! I've been really good about steering clear of most Kickstarters, just trying to watch my money, but the new Kickstarter from Dwarven Forge has REALLY gotten my attention. I may just have to get in on this one! 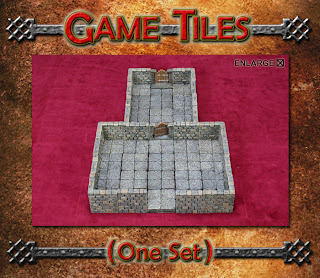 Dwarven Forge is a great company, very reliable and puts out one helluva product. I just can't really afford the amount needed to really do a dungeon up right, but this Kickstarter might be just what the Doctor er.. I mean DM ordered! I've done a bit more on this, changed a few things and added some stuff. It's pretty damn eclectic but I had fun doing it. With all the recent posts of folks (James Mishler, Blood Axe and Tenkar in particular) using Hexographer to create Campaign maps for their games I thought I'd give it a try. 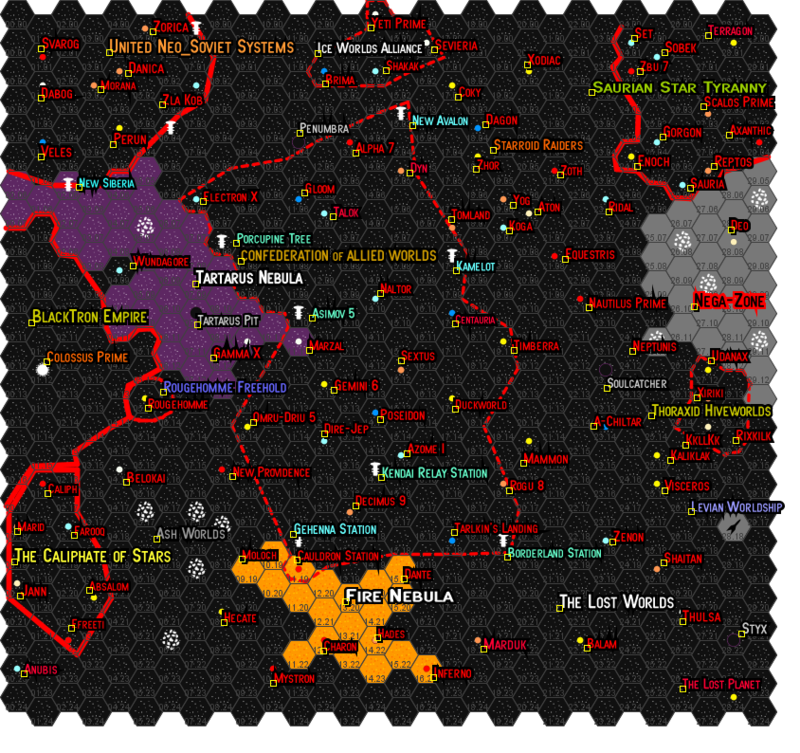 Well after several failed attempts to create a Fantasy Campaign map that I liked, and then an unsuccessful try at a Post Apocalypse map, I found myself getting inspired to work up a Sci Fi Sector map! This is very much a Work in Progress, I may lose the Space Commies (I'm not sure they now fit my plans...). The Caliphate of Stars are sort of Zhodani (sort of and without the armor). I'll probably change the name of the Ophidian Order to something else, I'm using the Ophidians from Dreamscarred Press's Psionics Unleashed for the main race there (along with a few other reptilian types). 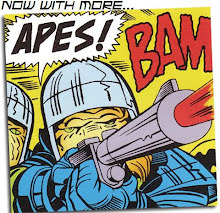 The Ophidians have retreated back into their section of space after the "Sleestak Wars" of ten years ago (the humans used the term as an insult for the serpent types, thanks Tetsubo!) 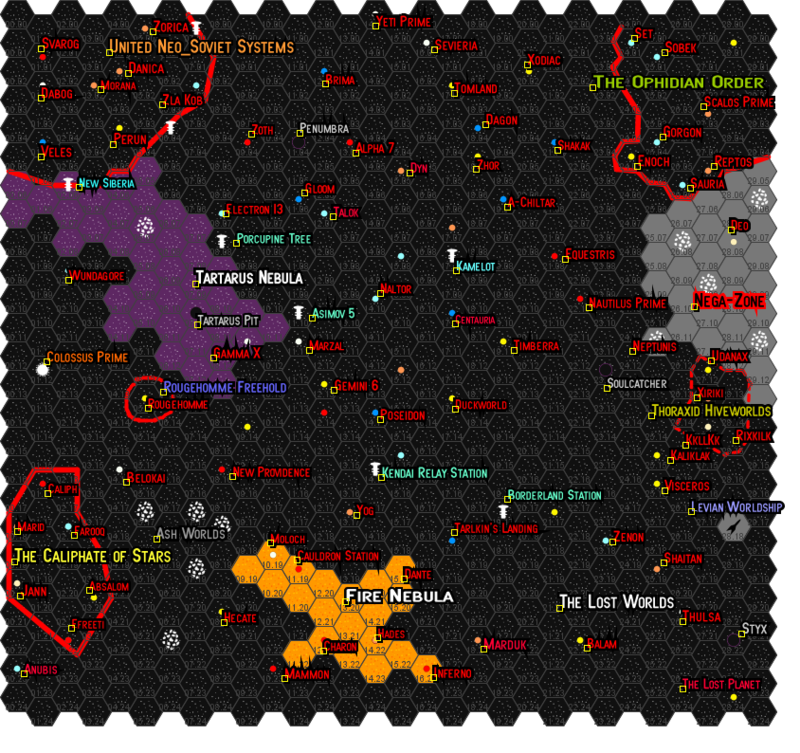 Some of the worlds are from a few of the Marvel races I've converted to SWN (Deo was once the center of a powerful multi-system Theocracy). Anyways let me know what you think, I've got a lot more fiddling to do with it, but wanted to share what I have so far. Even if I don't use this, I've had alot of fun working on it. +2 Bonus on Perception Checks due to superior vision, hearing and smell. Octopus-Kings, or Octo-Kings, are fearsome denizens of The Lost Planet. Malicious and cruel, they hate other sentient races with an intense fury, going out of their way to harm them. Some have managed to learn to speak the languages of other races; just so they can taunt and mock their victims prior to dining upon them (they find human flesh to be quite tasty). Octo-Kings tend to not get along with one another, but if the prey is right (tasty and human!) they will band together for short periods in order to capture the most food, infighting usually ensures and these bands disperse as quickly as they were formed. Octo-Kings possess four sets of eyes providing them with keen vision, including Dark vision out to 20 meters. Their large ears and noses provide them with enhanced senses of smell and hearing. In spite of their name, they tend to avoid water and damp conditions. They are most often found in the wastelands and twisted forests of The Lost Planet. While they understand the concepts of tools and technology they refuse to use such things, however these are not mindless beasts, they can open doors, pull levers and do other intelligent tasks in order to get at their prey. 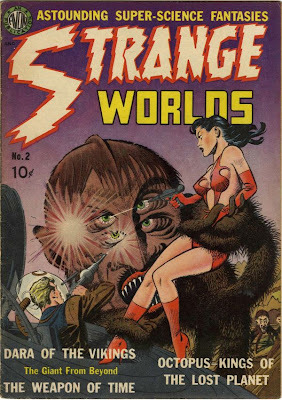 There are legends of Octo-Kings possessing Psionic powers and large bands of normal Octo-King followers but most consider such stories to be crazy tales. 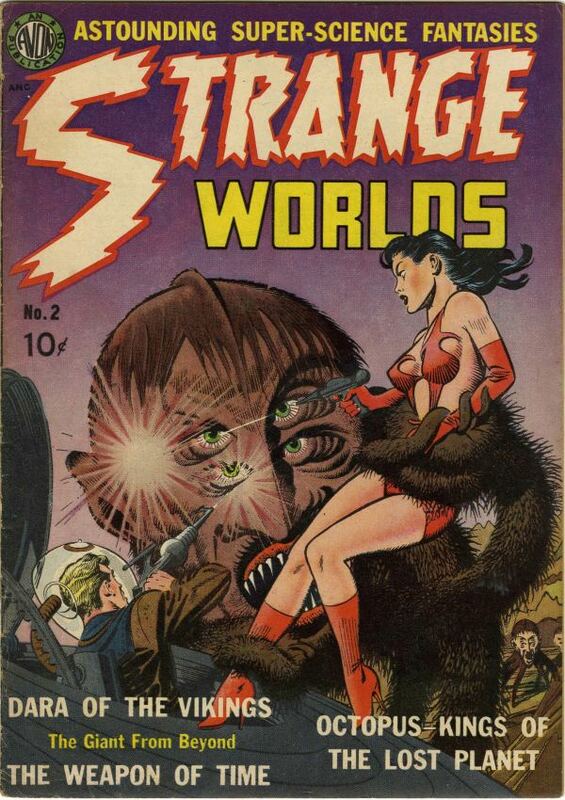 Loosely based on Cover of Strange Worlds #2, no copyright infringement is intended. 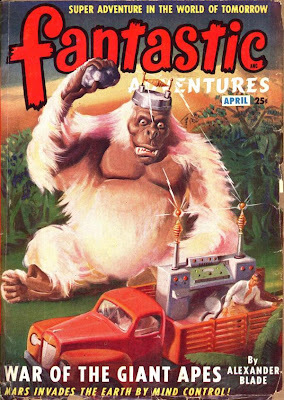 I hope everyone has a great Simian Saturday, I'm off to do some actual gaming at Mid-South Con! Woo Hoo! Hulks & Horrors now available! I just learned that the unsuccessful Kickstarter; Hulks & Horrors is now not only available, but for a limited time the PDF is Free! How cool is that! Here's a freebie for the Mutant Epoch RPG, a nasty mutant beastie to unleash upon your player's Excavator Teams! From the blurb, "In the wild places, ruins, tangled woodlands and wastes of The Mutant Epoch era, excavators, scavengers, traders and nomads can bet on one certainty, that they will encounter never before seen beasts. 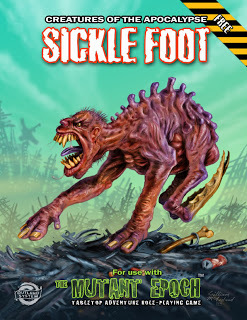 The fast moving, bear sized, swearing Sickle Foot is just one of many all new creatures that player characters can run into while exploring The Mutant Epoch RPG." Sorry for my lack of posts, I continue to be quite busy at work, but am hoping things will ease up soon. I'm still quite impressed with the Blood and Treasure RPG. Here's an undead monster I worked up. At the mere sight of a Cliff Mummy in motion, one must succeed on a Will save or be paralyzed with fear for 1d4 rds. 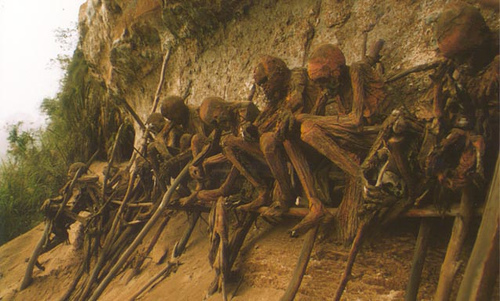 The touch of a Cliff Mummy is painful; their hands give off a blistering heat that causes an additional 2 points of damage to any successful attacks they make. Once per day, a Cliff Mummy can exhale a cloud of black smoke which acts like the Obscuring Mist spell, the Mummy can see through the smoke without difficulty. 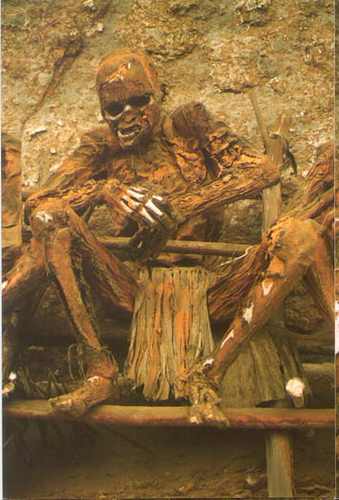 Witchdoctors of certain savage human tribes to the South have developed the means to create a form of undead guardian to watch over sacred sites. Through a series of dark rituals, involving the use of a magical fire that dries out the corpse of a former witchdoctor, these foul creatures are created. Cliff Mummies are quite evil and can be unpredictable, there are some legends of Cliff Mummies that after slaying an intruder have then left their cliffside perch to enter the very villages that created them and kill every man, woman and child in their path (at GM's discretion there is a 10% chance that when "activated" they go on a killing rampage for 1d4 hours), after this rampage they return to their cliffside perch as if nothing had happened. Pictures are from the Mummies of Papua New Guinea.